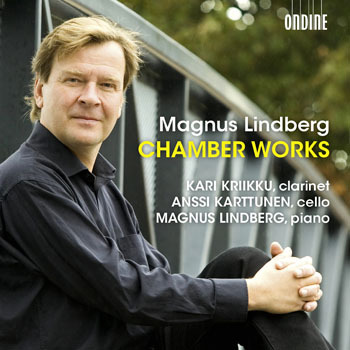 These world première recordings combine four of Magnus Lindberg's chamber works from the 2000s, although the roots of one of them go back to the 1990s. Magnus Lindberg's composer personality has always been coloured by a strong sense of practical musicianship. It is evident in his orchestral works and concertos in his rich instrumental invention and the demanding yet gratifying and idiomatic instrumental parts. The same applies to his chamber music works, but here the musicianship aspect is even more evident especially in more recent works, which Lindberg has written specifically for himself to perform on the piano. Magnus Lindberg has written many pieces for clarinetist Kari Kriikku and cellist Anssi Karttunen, two important figures in contemporary music scene in Finland. The Clarinet Trio, including fine reminiscences of Brahms and Ravel, now brings together these two musicians with the composer himself on piano. Hailed by the New York Times as "A physically flamboyant player of Olympian virtuosity...", Kari Kriikku has been a living inspiration behind a great number of remarkable Finnish compositions for the clarinet. On stage and through recordings, he has championed concertos and chamber works written for him by Kimmo Hakola, Jouni Kaipainen, Magnus Lindberg, Uljas Pulkkis, Kaija Saariaho, and Jukka Tiensuu. Above all, Kari Kriikku has premiered the entire output for clarinet by Magnus Lindberg. His recording of the Clarinet Concerto earned him both a Gramophone Award and a BBC Music Magazine Award in 2006. Anssi Karttunen is a passionate advocate for contemporary music. He has performed over 125 world premieres, collaborating with such composers as Magnus Lindberg, Kaija Saariaho, Rolf Wallin, Luca Francesconi, and Tan Dun. An astounding 24 concertos have been written for him, among them Magnus Lindberg's cello concerto premiered with the Orchestre de Paris, and Kaija Saariaho's concerto Notes on Light.